PCB recycling machine (Printed circuit board separation and recycling machine) is for processing waste PCB boards for recycle use. And this PCB recycling machine is apply to recycle all kinds of circuit boards, PCB boards, FPCB boards and other electric wastes. The PCB recycling machine has no requirement for the advanced disassembly of the PCB boards contain electrical apparatus element. It can be directly processed by the PCB recycling machine without pretreatment. The recovery rate of the waste PCB boards gone through first crude crushing, magnetic separation, second fine crushing, dust collection, air classification, vibratory screening, gravity separation and electric separation can reach to more than 99%. The whole PCB recycling process from feeding to separation adopt automatic operation, which only need 1-2 workers to operate. And the separation method of this PCB recycling process is dry type separation, no need heating, burning, water washing and chemical processing, the operation cost is very low, but has very high efficiency. The whole PCB recycling process doesn’t have any pollution, which is a kind of environmental protection machinery. Prev:How many waste tyre pyrolysis recycling plant in Mexico ? Next:Where to recycle scrap copper cable wire ? 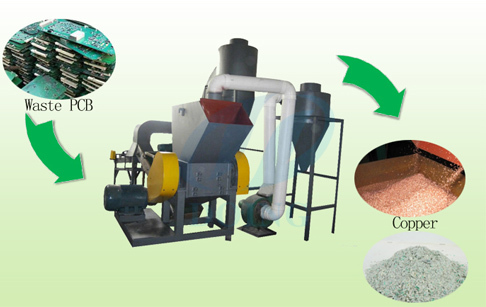 If you wanna to get more details about What is PCB recycling machine? you can send E-mail to market@doinggroup.com. You can consult our professional engineer and specialized sales team with leave a message in below form.We will contact with you ASAP.You also can visit our factory in Henan,China.Get Detailed address.